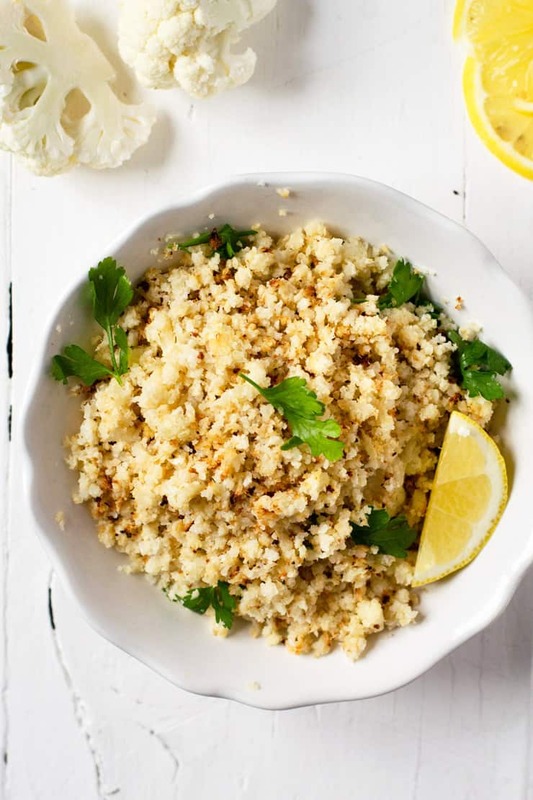 Top tips for how to make the best roasted cauliflower rice. This recipe is a delicious and healthy alternative to white rice! (grain free, gluten free). I hope your July 4th weekend was as fun and relaxing as ours! After all that cobbler and ice cream, though, it’s nice to get back on the healthy train. So today seemed like a great time to share my Top 5 tips for making the best cauliflower rice! It’s gluten free, grain free, and 100% unprocessed! Even if you eat “real rice”, it’s a great way to sneak some extra veggies into your meal, and you might be surprised by how much you like it! Wash the cauliflower, then cut into large florets (not larger than the width of the food processor chute). Place the course shredder blade into your food processor and feed the florets through the chute. Divide the riced cauliflower between two baking sheets. Drizzle 2 Tbsp of melted ghee over each pan, then use clean hands to “massage” until rice is fully coated with ghee. You can use the standard chopping blade of your food processor (I’ve done it before with success), but the result is more of a couscous texture than that of long grain rice. You also have to work in batches, which I’m never a fan of if I can avoid it. I much prefer quickly feeding handfuls of florets into the chute of the food processor, one after another, with the shredder blade in place. It shaves time off the prep and gives the “rice” a more authentic, longer grain shape. Just as with “real rice”, the right amount of butter and salt take this cauliflower rice from good to great! I add plenty of melted ghee and sea salt before cooking, then usually sprinkle a little more sea salt on it just before serving. Stovetop cooking works if you’re able to stir often (think stir fry) to prevent sticking and burning, but roasting is my favorite. It’s a simple, hands-off method so you can prep the rest of your dinner while the oven does the work. You could even roast a tray of okra or broccoli at the same time! I prefer to serve cauliflower rice alongside really flavorful main dish recipes – Lemon Feta Chicken and Easy Salmon with Roasted Butternut Squash and Kale come to mind. And, don’t forget, you can always blend cauliflower rice 50/50 with regular cooked rice – this is a great approach if you’re new to cauliflower rice, or are serving it to “real rice” lovers! Here’s the deal. Cauliflower rice is NOT rice – never will be. But it’s a pretty close second. I don’t try to pull one over on my family by calling it rice. I tell them I’m serving shredded and roasted cauliflower that looks, tastes, and feels a lot like rice. That way, everyone knows what to expect, and is happy when they get it. 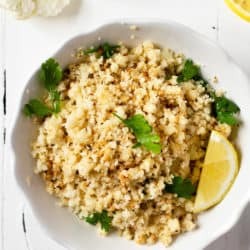 Whether you're grain free or just trying to eat more veggies, this delicious roasted cauliflower rice is a healthy alternative to white rice! Place the course shredder blade into your food processor and feed the florets through the chute. 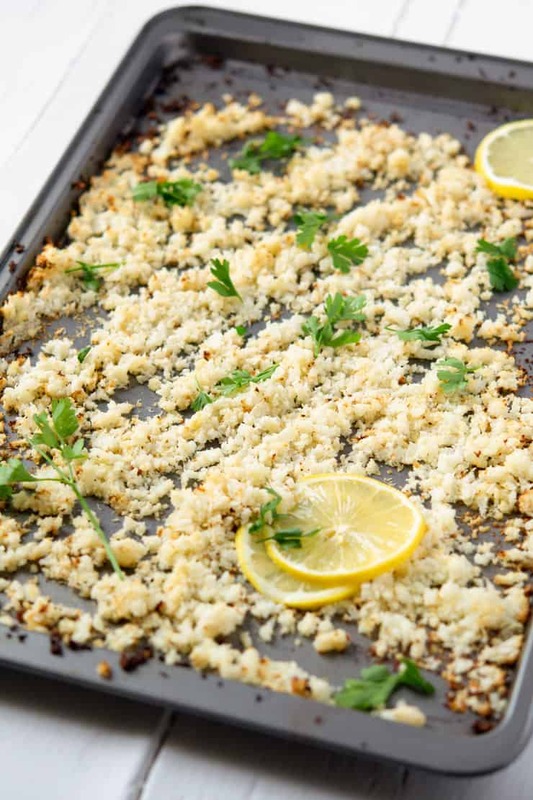 Divide the riced cauliflower between two baking sheets. Drizzle 2 Tbsp of melted ghee over each pan, then use clean hands to "massage" until rice is fully coated with ghee. 1. I used lighter baking pans but you'll want to shorten the cooking time and may need to stir halfway if you're using darker roasting pans. 2. 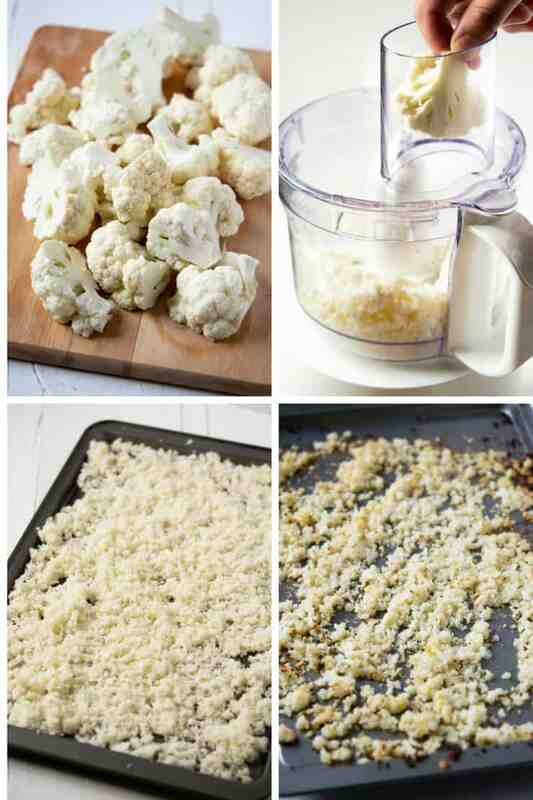 Time saving tip: shred two heads of cauliflower and freeze half for later use! Your turn – what are your favorite tips & recipes for making cauliflower rice? Hi Cynthia, good question. Ghee is clarified butter, which can be found in many stores or online (I just went back to #2 in the post and added a link to my very favorite brand of pastured ghee, which you can buy on Amazon). However, you can substitute any type of high heat oil or pastured lard/tallow (which you would also want to melt before adding). Roasting cauliflower (besides grilling) is the only way I cook it. This sounds so good…I have not made it this way before. The perfect side to any protein, ad a great sub for regular rice or potatoes. I’m embarrassed to say that I’ve never roasted cauliflower because I’m really not a fan but after reading this post I’m going to give it another try. Everything taste better roasted so I’m not sure why I have never tried that. I have been dying to try making cauliflower rice for ages. I love that you roast it. Need to try this! Roasted cauliflower is so good, but I’ve never done it for rice. I’ll definitely have to try this. Thanks for sharing! Gorgeous photos here! I like all the step by step, thank you so much for sharing. I’ve been meaning to try cauliflower rice for ages, but haven’t gotten about to do so yet, but you re-inspired me to give it a go! Good timing, I just bought a bag of cauliflower and really didn’t want to just have it steamed. This is a must try recipe. What a genius idea to roast it instead or saute. I would love a recipe like this because I love lemon. You know I have seen many recipes with cauliflower rice but have not made it just yet. Your method is very nice love that you are roasting the riced cauliflower that adds a lot of flavor! I love the idea to roast it instead of stir frying it because my attention span is way too short to not let it burn. I totally agree with you about spinning it correctly. If I called it rice my husband would act like he was missing out, but if I just say “with shredded cauliflower” he’d never even think that rice was the alternative and everyone is happier. I do put a lot of focus on eating veggies. I think I don’t get enough of them in my daily meals. So your recipe came jsut in time and is such a great alternative to the white rice that I have been eating a lot lately. Thank you! Riced cauliflower is a staple in my house, but I’ve never thought to roast it. I bet it tastes soooo much better this way. I’m kind of disappointed in myself for never thinking to do this, lol. Thanks for sharing! 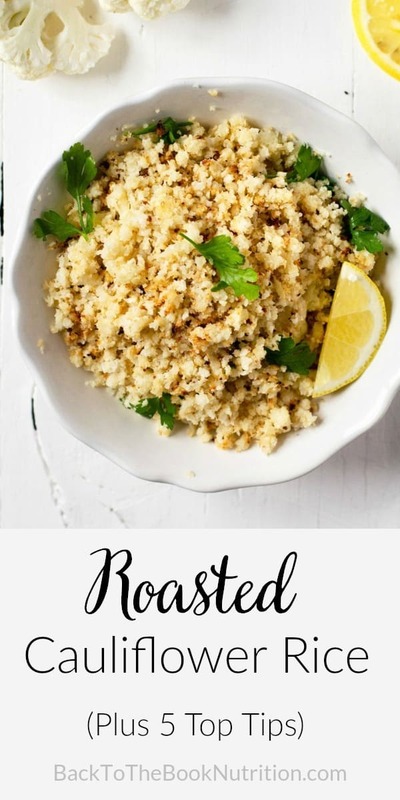 ROASTED cauliflower rice?!?! YUMMY!! Seriously, I love the flavor roasting gives cauliflower and to have that flavor with cauli rice would be DIVINE!! Oh yum! I love how you roast this cauliflower rice to make it less watery/soggy. I usually cook mine as fried rice and add all the proteins/ingredients. Yes, the roasting (or stir frying) adds such a nice texture! This looks so delicious and easy to make! I bet it would be a great base for all sorts of veggies!